On this page we derive the rotation values from a point mass (particle). The point mass is not necessarily rotating about its own axis (although it could, subatomic particles have spin). What we are interested in here is the contribution of the particle to the rotational properties of a bigger mass about some fixed point. If I am not making myself very clear try reading numerical methods. The following pages will then go on to derive quantities for finite solid bodies by integrating across the volume. Most of these quantities are vectors of dimension 3 which has a component in the x,y and z directions. 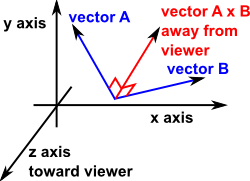 To denote a vector quantity we show an arrow above the quantity, for more information about vectors see here. The instantaneous angular momentum of a particle is the product of its mass and its angular velocity. As with rotation velocity, the angular momentum of a point is not an absolute value, but it depends on which point that the rotation is measured about. As discussed here, angular momentum of any closed system is conserved. However the particle under consideration here, may have external forces acting on it, so it is not a closed system. When we go on to consider a rigid body rotating about its centre of mass, then the angular momentum of the whole system (about any point) is conserved, this is the sum of the angular momentums of the particles that make up the body. So as it rotates, the instantaneous angular momentum of each particle that makes up the body, will be continuously varying, but the total angular momentum is constant. The torque, about point , caused by a force is the cross product of distance from and the force . Note that this is both a linear force and a torque about . If we want a 'pure' torque without any net linear force then, we can apply two equal and opposite forces to two particles which are offset. If we want a 'pure' linear force without any net torque, then this will only happen if the torque is measured about the centre of mass of a system of particles, and the force is applied in line with the centre of mass. However on this page we are considering a single particle only, we will go on to consider solid bodies later. We now want to derive the relationship between and . For, linear motion we have =m from Newtons second law. But how do we derive this for a particle? and why is the rotational equivalent of the scalar m (mass) a matrix [I]? what are the components of [I] and how are they related to m? The vector cross product can by replaced by matrix multiplication with a skew symmetric matrix as defined below. Which is the same result as the matrix method, but it does not give us any more information, what I would really like to do is combine this rotational expression with the equivalent linear equation F=ma. Can anyone help me find a way to do that? The angular momentum of a solid object depends on the point that we are measuring to rotation around. Even a non-rotating object, which is travelling in a straight line in the inertial frame has a non zero angular momentum if its trajectory does not pass through the point we are measuring to rotation around. Angular momentum is only conserved when we are measuring the momentum about the same unchanging point for all objects. Angular momentum is only conserved for closed systems, we have to be careful to take into account all external influences on the system.